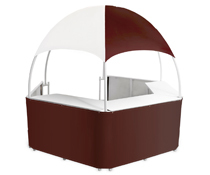 What is a custom canopy? 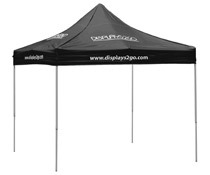 Portable tents, such as the products seen here, are designed for use during trade shows and promotional appearances for businesses. Each custom canopy not only provides shade from the sun, which is great for outdoor functions, but they are also occasionally used to provide shelter. Most popup tents are portable, and incredibly easy to set up. 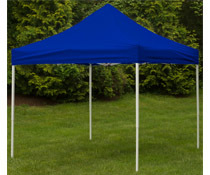 However, customers should keep in mind the size of the custom canopy being purchased; the larger the outdoor pop up tent, the longer it might take to set up. 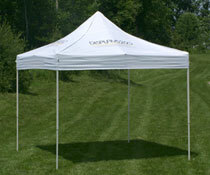 This custom canopy category includes promotional tents that are ideal for any occasion. These are not your "department store" or camping style canopies, as they are made for frequent and repetitive long-term use. Most of the custom canopy options include a heavy duty aluminum frame, polyester sidewalls and coverings made from fire and water resistant materials, as well as color imprinting. 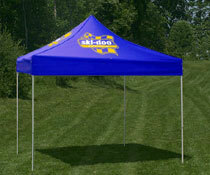 Each trade show tent, called EZ or easy-up tents, also includes a carrying bag for ease of transport. 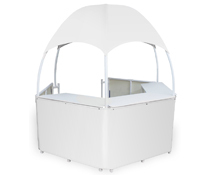 However, when transporting the custom canopy, the use of more than one person is recommended for carrying. Simply collapse the aluminum frame and slide the unit into the bag. 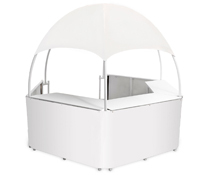 Where can custom canopy be used? 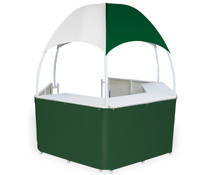 Additional outdoor tents options also include portable folding tables which act as counters within each fixture. The counters are often used to display promotional materials, and are also preferred by food vendors, as food and beverage merchandise can be placed on the counters for patrons and passersby to take and savor. 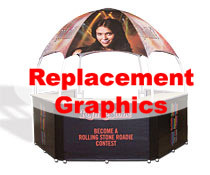 Each folding table measures 104"w x 32-3/4"h x 17-3/4"d. Similar to custom graphic tents design, the tables can also be folded down for easier transport as well. 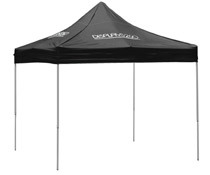 These portable pop up tents are sold in a variety of sizes and shapes, including square and rectangular. 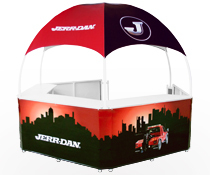 The small 10' x 10' event canopy, like a promotional booth is ideal for ticket sales, product demonstrations and more. The 20' x 20' square tents, however, are ideally used outdoors, but can also be positioned in spacious indoor arenas. 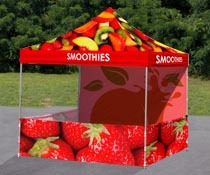 This large event canopy is used by big companies looking to make a visual impact. Some of the EZ or easy-up promotional tents in this category feature a gazebo-like design, similar to a booth. 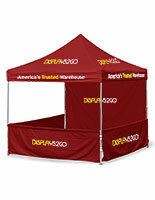 This custom logo tent features an open back design, ideal for employees to interact with passing patrons. 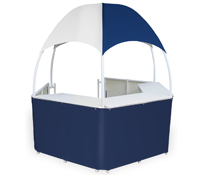 Some of the popup tent displays also feature a rectangular design with counters. These counters enable clerks working the event to display promotional merchandise, such as informational literature and more. 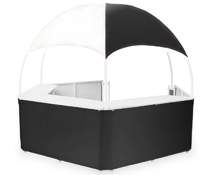 The covering on the top provides shade to employees as well. 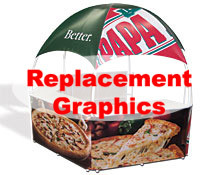 Other full color designed canopy shelters in this category include custom printing. 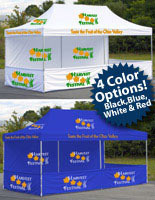 These popup tents are suitable for companies looking to get their name out to the public. Event canopies, also called portable booths with imprinted logos are popular for use by most businesses. 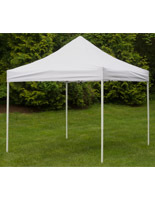 These aluminum frame promo tents provide a professional look, while also providing shade for employees to work in during a function. 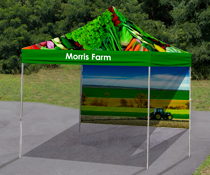 Each outdoor canopy is imprinted using a silkscreen process. Customers have the choice between one, two or three color printing. Logos are printed on all sides of the event canopy, as well as optional half walls and full back walls. 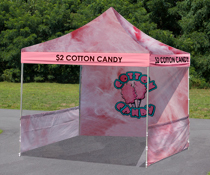 The valances are imprinted using a 90"w x 8"h graphic or text provided by customers, while the other areas of the EZ-up tent are printed using 50"w x 30"h logos or graphics. 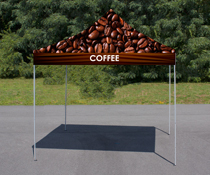 Designing your event canopy is easy, as each product page includes artwork guidelines and templates. These are designed to guide customers through the artwork submission process. 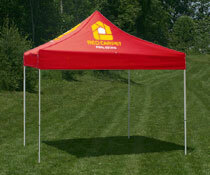 Designed for use outside, each graphic designed tents comes with both ground stakes and sand bags. 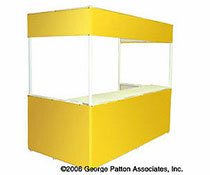 The convention booth should be weighted down when set up on pavement, as the unit may move in windy conditions. 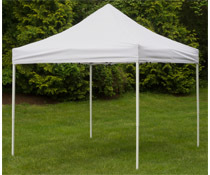 The use of both the ground stakes and sand bags is strongly recommended, to ensure that your event canopy does not move. 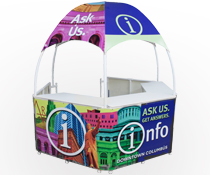 Radio stations, school clubs and multiple other marketing companies all use these portable booths for their promotional events. 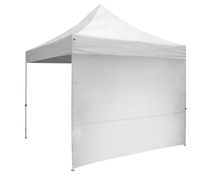 Most of the aluminum custom graphic and logo tents options in this category feature commercial strength vinyl fabric walls. This material is strong, and able to withstand frequent use. The vinyl fabric also features a lining, to prevent the absorption of material. The material can also easily be cleaned. Simply use mild soap and water to clean. The use of stronger cleaners, such as chlorine bleach or ammonia-based cleaners is not recommended. 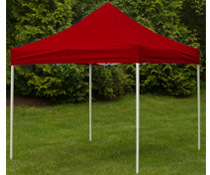 What event canopy styles are offered in this online catalog? Outdoor tents with counters…& More! 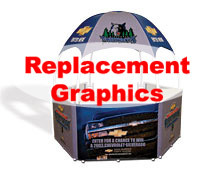 We sell portable booths as well as replacement graphics for these shade displays. 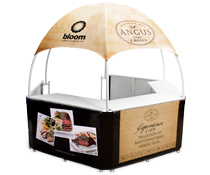 In addition to outdoor displays and concession stands, Displays2go also sells thousands of trade show supplies, retail fixtures, and point of purchase products that may better suit your needs. Most of our items are in stock and ready to ship, so place your order today. 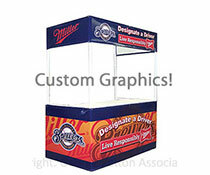 Orders placed by 3PM ship same day, while custom displays are typically ready in as little as four days. Start shopping today and place your order using our secure checkout process. 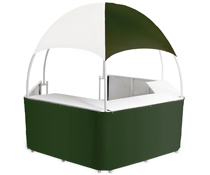 These portable pop up tents are part of a line of displays for use outdoors. Sidewalk signs, bulletin boards and event flags are also a part of this series. The majority of the products offered here are in stock and ready to ship. By stocking these units in three large warehouses, we are able to offer customers the shortest lead times found anywhere on the web. All of the merchandise for sale here are crafted from quality materials, yet are affordably priced. 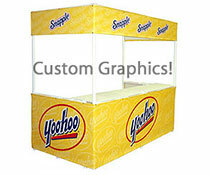 Outdoor displays are not the only product line this website has to offer. Over 7,000 unique items can be found in this online catalog. 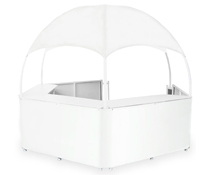 As a business-to-business company, the items offered here are designed for use by multiple industries, including retail stores, hotels and trade show vendors. In addition, each day new products are added to this online catalog, in an effort to offer customers one stop shopping. No matter if you are looking to furnish your retail store with new display fixtures, or adding directional signage outside of your business, this site has it all. 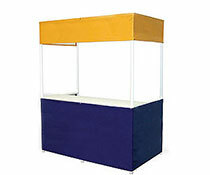 Buy quality marketing displays, including EZ or easy-up tents, from this trusted online supplier.